I love trading the gold mining ETF GDX against the gold ETF GLD. This is probably one of my favorite trades of 2011. GLD has been volatile lately but remains close to all-time highs. 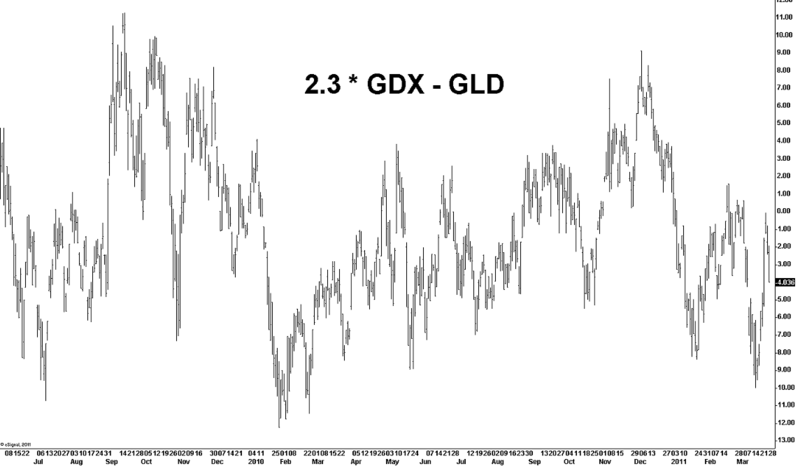 GDX is statistically nearly twice as volatile but has managed to tracked GLD very well. The spread itself has demonstrated an ability to move very aggressively in both directions while remaining range-bound regardless of the steady march higher of gold. You may ask yourself why I’m willing to step in and play the spread from the short side in what appears to be the bottom/mid-point of a nasty 20 dollar range. Especially when I’ve previously played it short from much higher levels. First off, I’m varying my bet size to allow for some additional risk. Second of all I feel I have a macro shift that is acting as a wind at my back in the trade. I’m always much more confident to be short GDX and long GLD for a simple structural reason. If you agree that the a primary driver of holding gold long is a protection against inflation then surely you will be in favor of shorting a group of companies that exchanges a physical store wealth for paper assets, right? This is exactly what gold miners do. They extract precious gold from the ground and exchange it for paper. If the purchasing power of dollars is eroded gold miners have no hope of matching the price performance of the physical asset. Based on the inflation thesis this spread is probable to move MUCH lower. Which means I have to step up and sell it here even though it feels unnatural as a contrarian. This is why I’m willing to sit in the spread short for days or even weeks, but I never hold the spread long for more than a day or so. Playing GDX from the long side is strictly a volatility play. Which makes it a perfect candidate for James Altucher’s Unilateral Pairs Trade. When you’re scalping short-term volatility in GDX why bother shorting gold?